What do you do when you’re a serious trained musician, one who’s already enjoyed a successful stint in one of the top bands in the land – both in terms of popularity and respect – and are now out on your own and you’ve unexpectedly clicked commercially with a type of music that is decidedly cruder in nature than your upbringing would indicate, and one that you may not quite have even been intending to pursue in the first place, but rather fell into it? That’s the question Joe Morris was asking himself as 1948 came to an end, capping off a whirlwind year and a half in which he and saxophonist Johnny Griffin had left Lionel Hampton’s acclaimed band to start their own group, then recorded for three different labels mostly in a jazz-rooted style as was befitting their background, but with a few sides thrown in that were decidedly less refined. When it was THOSE songs which did best in the new genre of rock ‘n’ roll Morris and crew were faced with a dilemma. The point of cutting records after all was theoretically to SELL them, have hits and to make money. The more they sold, the more you’d be able to command as a live act, which in turn meant the more you’d spread your name and the more records you’d be able to sell in the future. Basic business in other words. But now they were selling records in a style that appealed to a much different constituency than the one they’d expected to reach, and it was an audience that was by no means assured of frequenting the types of classier clubs they were used to playing with Hampton. This new breed of music fan may in fact not appreciate the more refined style they had specialized in prior to their somewhat accidental rock excursions forcing them to shed their musical upbringing in an attempt to sound decidedly crude simply to mollify this rowdy rock crowd. And so it was that Joe Morris was at the crossroads of a career that was just starting to take off. In front of him were two distinctly different paths to choose from, one which had shown solid early returns in a style that was still relatively new and certainly less musically respectable, while the other had a much better image and a longer track record and was a style he and his fellow musicians appreciated, but which had far more competition and its commercial potential was potentially on the wane. Morris wasn’t yet thirty years old and had his whole career ahead of him. Who knew how long this rock ‘n’ roll music was going to last (ironically it lasted a lot longer than Morris, who died tragically young), but the one thing everyone involved knew, from Joe and the band to Atlantic Records heads Ahmet Ertegun and Herb Abramson, both jazz aficionados themselves, and that was one very pertinent fact: His three Atlantic releases to date had two sides apiece and each single had featured one jazz song which elicited absolutely no verifiable interest. The three rockers adorning the other side of those singles however had increasingly stirred the masses. The decision suddenly became a little easier. You know right away exactly what they’re aiming for here and sure enough it’s the rock audience. Kicking off with Griffin’s winding sax line the drums soon fall in behind him establishing a rather basic backbeat for the nicely named Weasel Walk. The horns churn restlessly, their repetitive riff grinding away beneath Griffin’s more urgent lead. No longer availing themselves of the guitar skills of George Freeman, who’d departed that fall, more of the arrangement falls on the horns with the piano picking up some of the slack. The first half of the record is where the rock crowd comes for their fix. By this point in rock’s evolution they – and we – know the dual approaches that work best with instrumentals. The slower groove are designed to transfix an audience while the more rousing honking is to try and elicit a frenzied response. The few records that have tried to bridge that gap, Paul Williams on Waxie Maxie comes to mind, failed to fully connect by not choosing one course and sticking to it. Morris attempts the same feat here and succeeds a little better, largely because he lets the individual horns each handle a specific role. His trumpet along with Bill McLemore’s baritone and Matthew Gee’s trombone take care of the underlying riff, playing the same siren call refrain with the drums anchoring things. Meanwhile he lets Griffin roam free, his playing meant to sound unhinged though he too is locked largely into a few patterns that he repeats throughout. But the dual nature of this part of the arrangement works, each part feeding off one another to create a vibrant sound full of lusty enthusiasm. For the most part that is. The middle section is somewhat discordant. The backing riff becomes a little grating now, wearing out its welcome because it doesn’t change at all while Griffin’s tone now clashes slightly to play a repetitive melody that heads nowhere. The sound starts to become a little monotonous, like they didn’t quite know where to take it next but knew they had to extend the song somehow. This is where they could’ve used a sudden shift in the arrangement to let another instrument take over, maybe a rousing drum break, or a piano taking the lead as the backing horns soften. Had Freeman stuck around for another few months instead of retreating to a comfortable home life with his family in an extended mid-career break his guitar would’ve worked wonders here, giving a different type of jolt just when they needed it. By offering nothing particularly inventive your mind starts to wander ever so much, the energy now seeming forced rather than coming off natural. All isn’t lost though, not by a long shot, as they shift once again and come roaring back to life for the last third of the record with Griffin now picking up steam as it heads into the stretch. They let him wail, his lines becoming more frantic as he goes along, doing his best to fit in with the screaming horns that have been so omnipresent on the rock scene the last year. In that respect he’s largely succeeding. And yet, if you’re a skeptic, you may say the closing arrangement is a little TOO mapped out, that they’re letting their jazz instincts take over in that regard, but you can’t say it isn’t effective. The mayhem they exhibit to close things out may in fact be largely planned, those responsorial flourishes by the other horns in particular, but as long as they keep ramping things up you really don’t mind that the accompanying fanfare is more well-thought out than the usual ad-libbed anarchy that has been featured to date on the records of other honking saxophone madmen. Its energy never lags even if you might question its authenticity and ultimately I guess that’s what matters most. Besides, who’s to say what’s “authentic” anyway? Even if it were drawn up right down to the final detail (yeah, THAT part, the “pop goes the weasel” quote, was definitely planned) the spirit they convey is largely convincing and even the best musicians are entitled to let themselves get caught up in the enthusiasm of the moment from time to time and maybe that’s just what this is. When jumping out of your seat to hit the dance floor Weasel Walk is an exciting record and that much is certainly by design. Whether they had started out down the rock road intentionally or not, they were now seemingly committed to it. The pull of jazz (the first form of commercial music that afforded black artists widespread fame, mainstream appeal and, most importantly, respect) wasn’t an easy thing to eradicate from the mindset of those who came of age dreaming of such things at a time when dreams, not reality, were all that they likely would ever wind up being and so there was bound to be some lingering conflicts over which avenue to pursue. But they were also professionals and as such they gave it their all when they tackled rock and when it started to pay off the choice of which direction to take was made for them. Because of that ultimate embrace of rock ‘n’ roll Morris’s internal conflicts over which musical pursuit he would follow don’t seem as profound because he never gave voice to those conflicts. Once he chose this direction he seemed satisfied to pursue hits in rock without feeling he was lowering himself in the process. When his more jazz-loyal band members, such as Griffin, left to return to their first love, there were no hard feelings on either one’s part. Then as rock music itself grew in popularity, Morris grew with it, achieving his biggest success in the early to mid-50’s and he didn’t look back at what might’ve been had he stuck with jazz. An antonym for conflict is being content, and in the end that appears to be the word to best describe Joe Morris. He seemed perfectly content with becoming a star in rock ‘n’ roll. He was so content in fact that we never really were sure whether, if given a choice, he’d have rather been even a more minor star in another field instead. As always with Joe Morris the intent is to just do a good job. Write and arrange good material for the style you’re doing, whatever that style may be, and then to play the music as well as you’re capable of playing. If it means sounding crass to more elite jazz snobs when you’re a rocker, so be it. If it means not always quite going as far into the gutter in search of a hit in rock, that’s okay too. In the end, like Joe himself, you’ll be pretty content with the results either way. 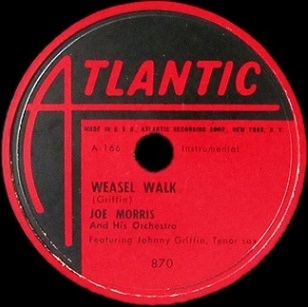 Leave a reply on "Joe Morris: “Weasel Walk”"